This week I am planning on using cherries and figs from the freezer, as we have lots of them. 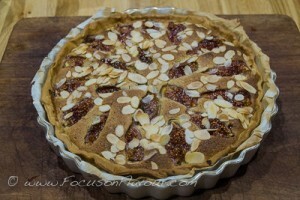 I’m hoping that defrosted figs will work well in this delicious Fig and Almond tart! If we didn’t have our own produce to use up, then I would be choosing pears, oranges and pineapple for desserts, which are all good right now. 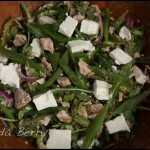 You can find several recipes for those by looking through the Recipe Index in the menu bar. I picked up a bargain pack of free range chicken legs, plus I already had a plan to make a batch of meatballs to prepare in 3 different ways (Scandinavian, Italian and Greek style), so this week is more meat-orientated than last. 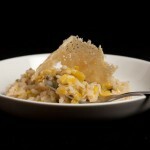 But we will have some fish with salad for lunch on a couple of days, and I am planning to do one of my favourite things ever with leeks – Leek Risotto with Parmesan Crisps. I have a lot of Green Beans in the freezer, plus there is still some kale and cabbage to gather, so I don’t need to buy much in the way of green veg. 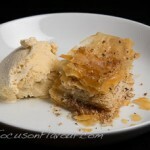 Looking ahead to next weekend, I am planning a Greek inspired day. With so much talk of how good the Mediterranean diet is, I don’t need much of an excuse for making Spanakopitta, which makes a great lunch with some salad and can also make a wonderful fast day meal. It is hard to find the right sort of cheese to make Saganaki with in France, so we bought some Kefalotiri when we were last in England, which I keep in the freezer. 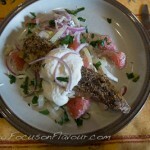 You may have seen Rick Stein cooking this on his recent series “Venice to Istanbul“. 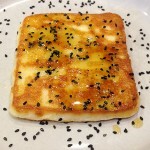 He suggests using Halloumi, but that is equally hard to source here. Sliced in half, dipped in semolina or flour and fried in olive oil, then drizzled with honey and sprinkled with black sesame seeds…. 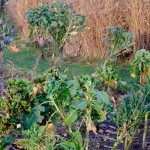 I remember having it with a fresh tomato sauce in Piraeus, which adds a lovely splash of colour. We will follow it with Keftedes and Lemon-infused Greek style Roast Potatoes (I think my idea for this comes from Tessa Kiros’ book “Food from Many Greek Kitchens“). Alongside that I plan to serve some green vegetables, cooked in the style of Horta (Mountain Greens) – steamed or boiled shredded kale, cabbage and sprout tops, most likely, as that is what I can gather from the garden at the moment – the key thing is the addition of olive oil and lemon juice! I’m planning to add the recipes for the Fig and Almond Tart and the Meatballs over the next few days, but the latter can be found in my book 5:2 Healthy Eating for Life, along with a number of the other ideas in this weeks meal plan. Have a tasty and healthy week – and try and move more! Wrap up well and get out in the crisp winter air, it may not last long! kefta, kofta, kufta, keftedes, albondigas, meatballs…. I put a recipe for Scandinavian meatballs in my book 5:2 Healthy Eating for Life, with a number of variations. This summer I have been making it as kefta kebabs, with Moroccan-inspired spices, which have proved to be hugely popular. Combining beef and pork helps to keep the cost down and they taste delicious. I find that one is enough for me on a fast day. 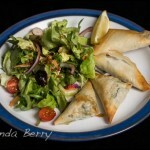 Really good served with a tomato and cucumber salad topped with toasted cumin seeds, or stuffed into pita bread with chopped lettuce, some luscious sliced tomatoes, sliced onions and tsatsiki. 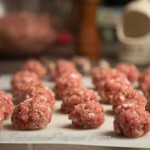 The kefta or meatballs can be frozen uncooked. Whizz the onions and eggs in a blender (with garlic if using) and then add the flour/breadcrumbs, seasoning and spices. Put this mixture with the meat in a large bowl and work it with your hands, adding water if needed to get a firm mixture that holds together. Let it rest for at least 15 minutes in the fridge. For the kefta I weigh into 75 gram amounts and form into rolls. 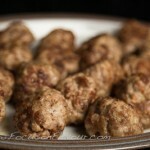 Use a walnut sized portion for meatballs. Either can be prepared ahead and refrigerated or frozen (defrost before cooking). 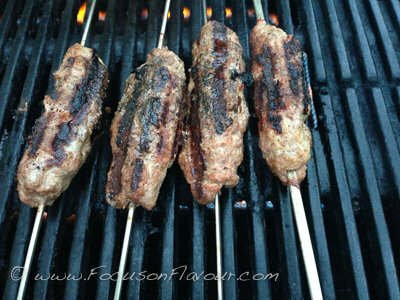 For kefta, put a metal skewer through the middle and BBQ over medium-high heat for about 15 minutes, turning regularly.